Yes. You are correct. It may even be quite a bit more than 8 times. However, the benchmark controls for this - all programs only use getchar. The idea is not to write the worlds fastest letter counting program, either use hFileSize or Data.ByteString for that. The idea is to have a benchmark with computation which has abstracted away the non-computation bit until C and Haskell can be compared as directly as possible. It's also a useful micro-benchmark. It's not too long and complex. It's a real task that people can wrap their heads around. There is a nice gentle progression between char/line/word counting. There are lots of good reasons for picking these benchmarks, but don't think of them as being too important - think of them as "ah, that's cute". What's new with this paper? If you've read the last paper, or seen a talk I've given, there are major differences in this paper. The largest change is that instead of waving my hands and trying to distract people with shiny things when the topic of non-termination comes up, I now have a good answer. The answer is homeomorphic embedding. I got this technique from Peter Jonsson, who in turn got it off Morten Sørensen and Robert Glück. It turns out my supervisor also used it in his thesis! There are other differences all over the place. I've managed to get results for most of the imaginary section of the nofib suite (12 benchmarks). I've also come up with a new generalisation strategy, have a better story of what to do with let's, and have tried to make my optimisation better defined. I want the the compilation times to be faster, the results to be better and more results on more benchmarks. Compilation times are between 10 seconds and 5 minutes, on a normal computer. Unfortunately my home machine isn't normal, it's 8 years old. I am hoping to improve the compilation speed to about the 2 second level, then I am going to do lots more benchmarks and investigate those where the optimisation doesn't do as well as I was hoping. * Warning: Benchmarks are hazardous to your health, always misleading and usually wrong. I've been working on optimising Haskell with the Supero project for a few months now. I've had some good success with small benchmarks, but scaling up to larger examples is always a challenge. Even a small benchmark, such as those from the imaginary section of nobench, can pull in nearly 1Mb of code from libraries. Debugging through 100,000 lines of low-level transformed Haskell is not pleasant! The benchmarks are unmodified from nobench, unlike last time I have not replaced key functions (i.e. getContents) with alternative versions. The Supero programs are optimised by Supero, then fed back into GHC - GHC's excellent native code generation is benefiting both programs. All the results are compared to GHC 6.6.1 -O2, which lacks SpecConstr, and is likely to give a benefit to the GHC benchmark. The benchmarks were generally chosen because they did not read an input file, and didn't output too much - I wanted this to be a test of computation, not IO. The benchmarks are just the ones I have tackled so far. The results are not stable. Yesterday two of the benchmarks showed substantially better results for Supero, and three didn't go through at all. Things are changing fast - there is no guarantee that any final release of Supero will match these numbers. All numbers are given relative to GHC taking 100%, i.e. all the benchmarks are at least 10% faster - and one is nearly three times faster. It is actually quite an achievement to draw with GHC in these benchmarks. GHC treats class dictionaries in a special manner (I think), and optimises them out specially. GHC also performs a reasonable amount of foldr/build fusion in several of the tests. Since these transformations rely on names and special knowledge, when compiling Yhc generated Haskell they can no longer be applied - so Supero must perform all these tricks to draw with GHC. I am sure there is further scope for improvement. Supero is a moving target - yesterday the primes benchmark went 50% faster, but now it is only 12% faster. Three days ago I rewrote the whole optimiser. It will be a while before large scale Haskell programs can be optimised, but it is certainly the final goal. About ten days ago, AngloHaskell 2007 took place. AngloHaskell was a unique meeting, in many respects. I thought it might be appropriate to share my thoughts on the event. With any luck, AngloHaskell will become an annual event. The first thing that surprised me about AngloHaskell 2007 was the attendance. There are several established academic events in the functional programming community, such as Fun In The Afternoon, ICFP and Haskell Workshop. Of these, only Haskell Workshop has an exclusively Haskell direction, and all are primarily a meeting for academics. On the other side of the coin, there are new Haskell user groups springing up around the world - London, San Francisco, and others - mostly based around a small geographical area. AngloHaskell managed to draw people from as far away as America and Italy, and certainly from far and wide over the UK, both academics, practitioners and those for whom Haskell is a hobby. I was pleasantly surprised by the number of people who don't have any work related to Haskell, but are simply interested. Simon Peyton Jones - Indexed type families in Haskell, and death to functional dependencies A really nice summary of the work going on in indexed type families, and why after all the work is finished, we'll be able to ditch functional dependencies. It seems to be an equivalently powerful way of saying equivalent things, just with a more functional style, and in ways I can understand (I still can't understand functional dependencies!). Ben Lippmeier - Type Inference and Optimisation for an Impure World An exploration of type inference in a language with side effects, guaranteeing optimisations are sound and permitting reordering. Neil Mitchell - Making Haskell Faster My talk on Supero, unfortunately I didn't manage to get the Nobench results in time, but I'll be blogging results in the next few days. Philippa Cowderoy - Experiences with Haskell as a person with Asperger's This talk was really unique, certainly not something that would ever have been presented at an academic venue. Philippa described some of the things in Haskell, and in the Community, that have helped her, and how she copes with Aspergers. Claude Heiland-Allen - Extending Pure-data with Haskell Pure-data is a program for doing music/visualisation in real time, which you can now extend with Haskell. The coolest aspect of this talk was the visualisations, showing Haskell in a very real context. Dan Licata - View Patterns View patterns are coming soon to GHC, as proposed for years and years. Pattern matching extensions, especially for things which have alternative representations - i.e. Sequence's and ByteString's. Lennart Augustsson - Fib, in Assembly Lennart generated assembly code for fib, from Haskell code. Scary stuff, showing how Haskell can both be a program, and an abstract syntax tree, with the appropriate Prelude and binding modifications. Duncan Coutts - Cabal Needs You Cabal is a critical infrastructure project for Haskell, but is sorely in need of more assistance. Duncan gave a brief overview of some of the features that need your help. Neil Mitchell - Yhc Yhc is a project with no clear goals and no overall plan - as people want to do something, they do, and it is welcomed. I tried to give some people an idea of where we are going, and what some of us want to do. Chris Smith - Monadic Subexpressions Another new piece of syntactic sugar that may be going into GHC are monadic subexpressions, which allow monadic actions to be placed more freely. I think this is a fantastic idea, others didn't. Chris is hoping to implement this feature, and got some good feedback from others. Philippa Cowderoy - Parsec as a Monad Transformer The Haskell 98 layout rule is dependent on the parse failure or success of the entire grammar. Philippa showed how this can be written in a beautiful way, simply using the new version of Parsec as a monad transformer. My slides are online here , and we are collecting the other slides over time. On the second day we met up, had breakfast, went rowing, then went to the pub. It was not a formal day of talks, but everyone got a chance to chat, discuss some projects and generally get to know each other. This year Philippa was in charge, with me providing some assistance. Hopefully next year someone else would like to try and organise the event. The helpfulness of the Haskell community makes it a joy - without such a strong community an event like this would never take place. Finally, I'd like to say thanks again to the speakers, and the people who attended. Also special thanks need to be given to Microsoft Research Cambridge, and in particular Sarah Cater, who provided a venue with catering, and could not have been more helpful! Making Haskell faster than C! Using much larger data sets, to increase the accuracy. Making sure all the tests are consistent, and that the playing field is level. Making the benchmarks repeatable, not relying on invariants that GHC does not promise. Understanding the precise results, I want to know why a particular benchmark gives the results it does. Improving the performance, where increased understanding enables this. 1) I've increased the default data set to 45Mb. This should give more accurate results. I've also benchmarked on a variety of computers, and found that the relative difference between processor and disk speed makes a massive difference. All the results given here are from my work machine. 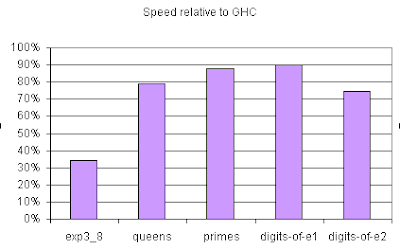 On my home machine Supero is up to 4 times faster than GHC! 2) It turned out that using -fvia-C meant that the gcc back end to GHC was inlining some primitive functions. I've now moved to using -fasm with ghc, which results in no inlining. I've also set appropriate definitions in the C to turn of inlining of their functions. With all these steps, no programming language does any inlining inside getchar() or isspace(). Since all programs do exactly the same number of calls to each function, this should not benefit/penalise any language, but is more consistent. 4) With more detailed and repeatable benchmarks, I've started to look for the precise reasons why a particular benchmark performs as it does. In doing so I've noticed that GHC can place heap checks in the wrong place, sometimes fails to infer the correct strictness information and has too many stack checks. I have reported each of these issues. 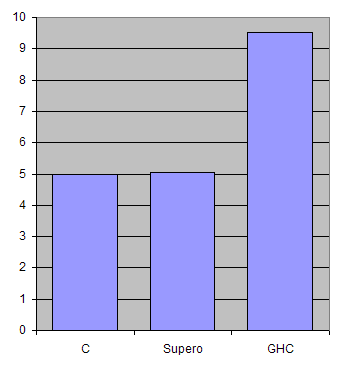 The benchmarks are performed with these problems present in the Supero results. As far as I am able to tell, if these three issues were solved, Supero would always obtain the same speed as C (with the same assembly code), or outperform C (in one case). 5) I discovered an issue with the words function, which I have brought to the attention of the Haskell library maintainers. 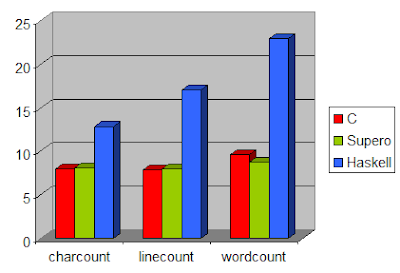 The words function as currently in the libraries performs two redundant isspace tests per word detected. The fix is simple, and has been applied to the libraries Supero uses. Note that the GHC result has not had this fix applied, so could be expected to improve. 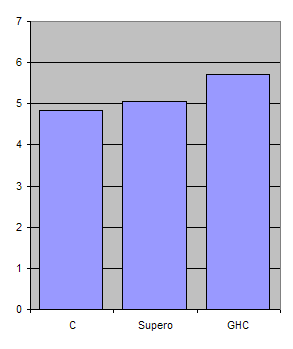 The benchmarks follow an expected pattern for character counting and line counting. The C version is minimally faster than the Supero version, 1.5% faster in both cases. The Haskell version lags substantially further behind. There are essentially two states - traversing through a sequence of spaces, or traversing through a sequence of non-spaces. Depending on which state you are in, and where you are transitioning to, you may need to increment a counter. The C code maintains this state information in last_space. However, this is not the fastest method. If that 1-bit of information was encoded in the program counter, i.e. by having different paths for being in a sequence of spaces vs non-spaces, the code can be further optimised: the last_space variable becomes redundant; the increment test can be eliminated in one branch. To implement two tight inner loops in C, where control can bounce between the loops, is not trivial. One approach is to use goto, but this often disables some optimisations. The other approach is to have nested while loops, with a return to exit the inner loop. Either way is unpleasant, and unnatural. The code is specified in a high-level manner. By running this code through Supero, it automatically produces the necessary pair of tight loops, with transitions between them, using tail calls. GHC takes this code and produces directly looping code, which is able to outperform the C equivalent. My next step is to take the Supero program, and try it on a larger range of benchmarks. I hope to tackle the nobench suite, competing against other Haskell compilers, rather than against C.
Update: You can actually further optimise the example in this post, which is done in my IFL 2007 Supero paper, available from my website. Haskell is great, as it's a pure language. This means that functions don't have side effects, so can be reordered, rearranged, inlined etc. very easily. All this means that you can do reasoning in Haskell in a similar manner to that which is done in mathematics. Most Haskell programmers will exploit the reasoning properties very often, refactoring their code. Today I used equational reasoning to solve a problem I was having, which makes a nice (and simple!) introduction. If you are using Hugs, a simple :f words will show you this code, which I've renamed and reformatted slightly. The key "eureka" moment is to see that s has all it's leading spaces dropped. Therefore, if s has any characters, the first must be a non-space. We then retest the first character to see if it is a space in break. This redundant test is unnecessary, but how to remove it? In Haskell equational reasoning can be used to remove the test, and serves as a proof that the code still has the same functionality. The first step is to instantiate s in the case alternative. This is safe as the branch above has already examined the constructor, so we do not loose laziness. Now we can inline break. Now we can rename ys to word and zs to rest. We now have a more efficient version of words which at every stage kept the same behaviour. I have emailed the Haskell libraries mailing list and hopefully this optimisation will be able to be applied to the standard libraries. In reality, when I did this transformation I skipped the inlining of break and relied on what I knew about its behaviour. If a student was to do this transformation in an exam, more detail would probably be required going from (not . isSpace) in span. Either way, as your experience grows these transformations become more natural, and are a fundamental part of working with Haskell. As part of my work on Hoogle 4 I've been bashing my deferred binary library quite a lot. I encountered one bug which I hadn't considered, and was able to come up with a solution, using phantom types. I've read about phantom types before, but never actually put them into practice! The idea is that to save a value, you step through the list trying to match each constructor, using Control.Exception.catch to see if the value does not match. Once you have matched, you save an index, and the components. To load a value, you take the index and pick the correct construction. This time, you deliberately do not mention any of the fields, and by remaining lazy on the fields, the pattern match is not invoked. This solution took quite a lot of thought to arrive at, but does minimize the size of the instance declarations. The instance relies crucially on the laziness/strictness of the functions - the load function must not examine any of its arguments (or you will pattern-match fail), the save function must examine at least one argument (to provoke pattern-match failure). After writing a description such as this, I am sure some users will have spotted the issue! This (<<!) operator is only required for 0-arity constructors, but is not harmful in other cases. Now the correct fix has been decided upon, we can fix the Hoogle instances. Unfortunately, we can still write the incorrect case, and will get no warning - a bug just waiting to happen. The solution to this is to use phantom types. Now the type of unit is PendingNone, but the type of all other operations is PendingSome. By demanding that the list "defer" accepts is all PendingSome, we are able to raise a type error if the (<<!) is missed. By using phantom types, a easy to make error can be guarded against statically. Plus, its not very hard to do! I've done some more work on Hoogle 4, and can now create a database from a textual file, then perform text searches upon the database and show the results. It is basically a command line version of Hoogle restricted to text search only. A lot of the time went on debugging binarydefer, which has saved a lot of effort and meant that all the mistakes due to complex file prodding and seeking are localised in a library which can be reused throughout. Hoogle 4 is both a library and a program, and now I have a minimal API which is mostly free from any monads. Of course, it wouldn't be a new version of Hoogle if I didn't have a new way to perform type searches :) The new type searches are based on six operations, the idea is that you start with a target type (what the user queried for), and transform the type into the source type (from the source code). Each transformation has a cost associated with it, and can be run in both directions. I finalised the six tranformation steps some time ago, and they have been floating around on my desk as a piece of paper - not a safe place for paper to live. As such, I've decided to write them up there, in the hope that Google won't loose them. Each operation has an associated symbol, I've included these symbols in \tex as as well Unicode. Alpha conversion \alpha (α): a --> b. The standard lambda calculus rule, but this time alpha conversion is not free. Unboxing \box (□) : m a --> a. Given something in a box, take it out. For example Maybe a --> a would be an example. Restriction (! ): M --> a. Given something concrete like Bool, turn it into a free variable. Aliasing (=): a --> alias(a). This makes use of the type keyword in Haskell, for example String --> [Char], because type String = [Char]. Context \Rightarrow (⇒): C a => a --> a. Drops the context on a variable, i.e. Eq a => a --> a. Membership \in (∈): C M => M --> C a => a. For example, Bool --> Eq a => a. There are some additional restrictions, and methods for applying these rules, but these are the core of the system. I haven't done much on Hoogle 4 in quite a while, and since I keep telling people that various bugs will be "fixed in Hoogle 4", it seems only polite to fix those bugs in the near future. I decided that this evening I would focus on Hoogle 4, since I was slowly going insane from writing academic papers. I'm now just about to go to bed, so thought I would summarise what I did. One of the things that has been slowing me down on Hoogle is the fact that I rarely get a chance to work on it, and when I do that means I have to refamiliarise myself with the code base. Each time I do this, I forget something, forget what I was working for, and generally end up slowing down development. It also means that working on Hoogle for "an odd half hour" is not practical, it takes at least a couple of hours to get up to speed. In order to solve this, I've done some diagrams of the module structure, and the main Hoogle database. They may not mean much to anyone else, but I hope they are enough to keep my mind fresh with where things go. Fortunately now all that is gone, and the structure is a lot more logical. The other thing I've been doing is moving to the Deferred Binary library. Part of the reason for Hoogle 4 becoming bogged down is the creation of a central database that is loaded on demand, and contains tries etc to perform efficient searches. Unfortunately, this loading on demand aspect had infected the entire code, resulting in a big IO Monad mess. It was slightly more pleasant than coding in C, but all the low-level thoughts had seeped through, requiring careful though, slow progress and frequent mistakes. To take one example, the Hoogle.DataBase.Texts module, which is responsible for performing all textual searches and storing the lazily-loaded trie. Compare the old version and the current version. The code has shrunk from 186 lines to 65 - of which only about 30 are real code. The IO Monad is nowhere to be seen - everything is pure. The really low-level functions such as sizeTree and layoutTree have gone entirely. I'm not sure when I will next be able to get to Hoogle 4, but next time I hope to start working on it faster, and that the cleaner code makes for happier coding! Note: I have started displaying adverts on this blog because it was only a button click away (very impressive integration by Google), it seemed like a fun thing to try and that the adverts in Gmail are sometimes quite helpful. I have deliberately picked to not show too many adverts, placed them off to the side where they won't interfere with reading and tried to keep it minimal - but if they are annoying please let me know. I am going to donate whatever money (if any) from this to charity - but please don't take that as an incentive to artificially click on adverts you aren't interested in. At the moment I'm working on a boilerplate removal for Haskell, which is faster (runtime), shorter (code), more type safe and requires fewer extensions than Scrap Your Boilerplate (SYB). However, since I haven't finished and released a stable version, I can't really recommend people use that. The reason I started working on this is because I was unaware of SYB when I started. Last week I also introduced someone to SYB, who had done quite a bit of Haskell programming, but had not stumbled across SYB. As a result, I think it needs a bit more attention - SYB is one of the strengths of Haskell! We define the data type as normal, adding deriving for Data and Typeable - the two key SYB types. We also add an import and a flag, just to get the GHC machinery working for the derivings. Wow, easy! This function will operate on anything which has a Data instance, so you can run it on an Expr, Stmt, [Stmt], [Either Stmt Expr] - the choice is yours. For the purposes of a short introduction, I'd recommend treating all the bits except the "f" as just something you write - read the full SYB paper to get all the details of what everything can be used for. Again, its pretty easy. And once again, consider all apart from the "f" as just something you write. The gains in code reduction that can be made with SYB are quite substantial, and by removing the boilerplate you get code which can be reused more easily. Boilerplate code is bad, and should be removed where necessary. We'll start the story at Visual Basic 3, because that's the first version I ever used. My Sixth Form would copy it to floppy disk if you bought in 3, which is basically school sponsored piracy. Anyway, this language was an imperative language, with build in support for graphical interfaces. You can spot a VB 3 program a mile away, they look clunky and alas VB made it really easy to change the background colour of a form. The ability to easily change the colours made it a hotbed for garish colours - does you inhouse application have pastel shades of red? If so its either a C programmer who went to a lot of work, or more likely, a VB programmer without any sense of style. I've seen these apps running on point-of-sale terminals in some shops. I'm going to lump these two versions into one, there were some changes, but not many. Continuing the same trend as VB 3, but moving towards being an object orientated language. This language had a very strong COM interoperation - all VB objects were COM objects, all COM objects could be used in VB. The COM ability made it ideal for many things, and opened up lots of easy to use libraries. All windows become objects, and some of the clunky bits in VB 3 got depreciated in favour of the newer methods, but most programs still worked exactly as before. Alas VB 6 still allows the background colours of a form to be set, but if you don't (please don't!) the program looks very Windows native - much more than Java or even C#. At the time of VB 5, Microsoft moved over to using VB as the language of scripting in Office, replacing WordScript etc. The VBA language is VB, but rather than have the VB libraries, it has the Office libraries. The languages are identical in general use. And finally we get to the newest edition, or ¬VB.NET as I will refer to it. When changing to C# with .NET, Microsoft decided that shunning all the VB developers would be a bad idea, so instead they shunned them and wrote a syntax wrapper round C#. The ¬VB.NET language is a perfectly fine language, but its not VB. Things like late binding have been removed, the syntax has been made more regular, the object facilities have totally changed etc. If you have a VB project of any mild complexity, then you'll not get very far with the automatic converter. If you are a VB developer looking to move towards the new .NET framework, I'd look at both ¬VB.NET and C#, before deciding which one to pick. The differences aren't that major, but at the time I was learning (.NET 1.0 beta) the ¬VB.NET was clearly the unloved younger brother of C# - the examples were all C#, and it was clearly the favoured language. Now both languages have evolved so they are not as similar, but neither is worthy of the VB name. VB was my first language, and my "first choice" language for years. After learning C I initially poured scorn on VB for not being a "real language", then I realised I was an idiot and that VB is a lot better for most application programming than C, and you can always interface to a C .dll if you must. Now Haskell and C# (for GUI's) have become my standard languages - I haven't started up VB 6 for quite a while. I've got a few programs written in VB 6 around that I technically maintain, but none that I've had any reports on in ages, and none that I can imagine working on. I've got at least 50 programs in my VB directory, but I've forgotten quite where I put my VB directory - its certainly not been opened in a while. Even though I may not use stand alone VB 6 anymore, I still maintain and actively work on some VBA solutions for accountants in Excel, and a couple of website templating systems using VBA in Word. I also develop and maintain a corporate website using VBScript, which requires new features adding at least once a year. VB is not yet dead, but its definitely going that way.